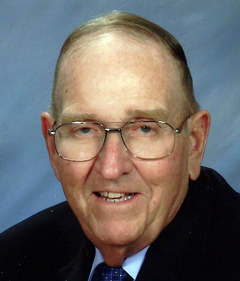 Kenneth Ariel Haby, of San Antonio, passed away on April 4, 2019 at his home at the age of 83 years. He was born November16, 1935 in the Cliff Community to Ariel Alphonse Haby and Julia Thelka Winkler Haby. Kenneth graduated from St. Louis High in 1953. On October 23, 1960, he married Kathleen Lorene Lutz at St. Louis Catholic Church. Kenneth was a parishioner of St. Louis Catholic Church and a member of St. Louis Men’s Society. He was an avid hunter and a member of the Quihi Gun Club. Kenneth was a World Champion Horn Rattler with the Texas Trophy Hunter’s Association and was one of the founding members of the Medina Valley Hunter’s Club. Survivors include his wife of 58 years, Kathleen Haby; daughter and son-in-law, Laurie and Michael Keller; grandchildren, Sheldon Keller, Amanda Keller and Hayden Keller; sister-in-law, Frankie Haby as well as numerous nieces, nephews and other relatives. Kenneth was preceded in death by his parents; brothers, Royce (Selma) Haby and Gilbert Haby; sisters, Margie Haby and Joyce Harwell. Visitation was Sunday, April 7, 2019 from 3:30 pm to 7:30 pm at Tondre-Guinn Funeral Home, with the Holy Rosary recited at 6:00 pm. Mass of the Resurrection was Monday, April 8, 2019 at 10:00 am at St. Louis Catholic Church. Interment followed at St. Louis Catholic Cemetery. Memorials may be made in Kenneth’s memory to St. Louis School, St. Louis Cemetery or the charity of your choice.